Shall We Dance? (Shall we ダンス?, Sharu wi Dansu?) is a 1996 Japanese film. 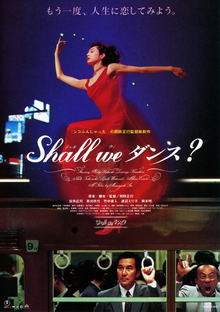 Its title refers to the song "Shall We Dance?" which comes from Rodgers and Hammerstein's The King and I. It was directed by Masayuki Suo. It inspired the 2004 American remake of the same name. Shohei Sugiyama (Kōji Yakusho) is a successful salaryman, with a house in the suburbs, a devoted wife, Masako (Hideko Hara), and a teenage daughter, Chikage (Ayano Nakamura). He works as an accountant for a firm in Tokyo. Despite these external signs of success, however, Sugiyama begins to feel as if his life has lost direction and meaning and falls into depression. One night, while coming home on the Seibu Ikebukuro Line, he spots a beautiful woman with a melancholy expression looking out from a window in a dance studio. This is Mai Kishikawa (Tamiyo Kusakari), a well-known figure on the Western ballroom dance circuit. Sugiyama becomes infatuated with her and decides to take lessons in order to get to know her better. Sugiyama's life changes once his classes begin. Rather than Mai, his teacher is Tamako Tamura (Reiko Kusamura), who becomes an important mentor to him. He meets his classmates: Tōkichi Hattori (Yu Tokui) who joined to impress his wife, and Masahiro Tanaka (Hiromasa Taguchi) who joined to lose weight. He also meets Toyoko Takahashi (Eriko Watanabe), another student. He further discovers that one of his colleagues from work Tomio Aoki (Naoto Takenaka) is a regular at the dance studio. Aoki, who is balding and mocked at work for his rigid ways, is revealed to be leading a secret life as a long-haired (via a wig) ballroom dancer. Though distant from her, the classes increase his infatuation for Mai. His secret thus becomes twofold: not only must he hide the lessons from his wife, he must also hide them from his friends and colleagues as it is considered embarrassing according to traditional Japanese customs to participate in Western ballroom dance. Later, after being rebuffed by Mai, Sugiyama discovers to his surprise that his passion for ballroom dance outweighs his infatuation with her. Indeed, dancing, rather than Mai, gives Sugiyama the meaning in life that he was looking for. Masako, noticing his odd behavior, thinks that he is having an affair — so she hires a private detective to follow him. Meanwhile, along with his classmates, Sugiyama enters an amateur competition – only to find out that his wife, having finally learned the truth from the detective (who has now become a devoted fan of ballroom dancing) is in the audience. Surprised by this, he stumbles and nearly knocks his dance partner to the floor. Though he is able to catch her, he accidentally rips the skirt of her dress off. Both leave the contest. Later, they learn that Tomio won the contest. When Tomio is ridiculed at work after his colleagues read of his success in the newspaper, Sugiyama stands up and tells them not to make fun of something they don't understand. At home, Sugiyama's wife tries to understand her husband's new passion by asking him to teach her to dance as well. He is invited to a good-bye party for Mai, who is leaving for Blackpool. At the party, Mai joins him to dance, asking him "Shall we dance?" Shall We Dance? was released on January 27, 1996 in Japan where it was distributed by Toho. It was released in the United States by Miramax. The Miramax version was cut to 118 minutes and released on July 4, 1997. It performed strongly in American theaters earning $9.7 million during its US release. It also grossed $33,287,618 in other territories (including ¥1.6 billion in Japan), for a worldwide total of $43 million. Shall We Dance? received a 93% rating from Rotten Tomatoes (Fresh: 28, Rotten: 2). Roger Ebert gave it 3.5 out of 4 stars, stating in the Chicago Sun Times that Shall We Dance? is "one of the more completely entertaining movies I've seen in a while—a well-crafted character study that, like a Hollywood movie with a skillful script, manipulates us but makes us like it." Critic Paul Tatara noted that "It isn't really fair to suggest that the movie's main subject is dance, though. As much as anything else, it's about the healing powers (and poetry) of simple self-expression." At the Japanese Academy Awards it won 14 awards: Best Film, Best Actor, Best Actress, Best Art Direction, Best Cinematography, Best Director, Best Editing, Best Lighting, Best Music Score, Best Screenplay, Best Sound, Best Supporting Actor, Best Supporting Actress, and Newcomer of the Year (in short, every award it was eligible to win). The National Board of Review gave it the award for Best Foreign Language Film. Shall We Dance? was remade by Miramax in 2004 as Shall We Dance? The American version stars Richard Gere and Jennifer Lopez in the Yakusho and Kusakari roles respectively. The American remake itself inspired another foreign remake. In 2006, an Egyptian film titled Let's Dance (Egyptian Arabic: ما تيجي نرقص‎, translit. Mah teegy nor'os) was released, starring Yousra in Richard Gere's role. Goldstein-Gidoni, Ofra; Daliot-Bul, Michal (March 2002). "'Shall We Dansu? ': Dancing with the 'West' in contemporary Japan". Japan Forum. 14 (1): 63–75. doi:10.1080/09555800120109032. OCLC 89180638. ^ a b c d e f g h i j k l m Galbraith IV 2008, p. 393. ^ Balio, Tino (2010). The Foreign Film Renaissance on American Screens, 1946–1973. University of Wisconsin Press. p. 304. ISBN 9780299247935. ^ "Shall We Dansu? (Shall We Dance?) (1997)". JP's Box Office. Retrieved 1 February 2019. ^ "1996年（1月～12月）". Eiren. Motion Picture Producers Association of Japan. Retrieved 1 February 2019. ^ "Shall We Dance? (1996)". Rotten Tomatoes. Retrieved 2008-08-11. ^ Ebert, Roger (1997-07-18). "Shall We Dance?". rogerebert.com. Chicago Sun-Times. Retrieved 2008-08-11. ^ Tatara, Paul (1997-07-19). "'Shall We Dance' a graceful tale of middle-age yearnings". CNN. Retrieved 2008-08-11. Awards for Shall We Dance? This page was last edited on 5 April 2019, at 20:32 (UTC).